I Love My Amazing Animals: National Taco Day! Hosted by Jazzi and Edgar!! National Taco Day! Hosted by Jazzi and Edgar!! Can you believe it! 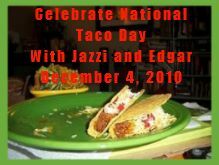 Jazzi and my newest friend Edgar at Calamities, started a national "taco" day on December 4...So post your taco eatin....on December 4th. Jazzi said that all those that join in and post their pictures will be given a little something special afterwards in the mail...Even more..Edgar and if you have a chance you should stop by his cute blog...is going to be hosting a drawing. He will put the names of all who post their Taco eatin..pictures in a big bowl and on Sunday he will have a Taco drawing! Very nice, if I do say so myself!!! Thanks Edgar! Don't forget to say hi to Jazzi too! Have fun and I hope you join in the fun!! Awwww what a great fun thing to do!! Good luck everyone!! Hello Edgar and Jazzi!! That sounds like fun - we haven't read about it before. We know Jazzi but not Edgar - we are behind as always......!!! Yum, tacos. Sounds like a great idea to me! We've never had a taco and our mom is vising gram for a whole week! This sounds like fun! Bummer! I will have to check out Edgar. Now did you wake that poor dog just to take his picture? Looks like he's saying 'what the heck is going on?" Mom is trying to figure out what kind of takhos to make! I hope my mom remembers it! Edgar and I just wanna have fun and eat something good at the same time. will be looking forward to your taco pictures!! We were just thinking when we saw the title, "does Jazzi know about this!" I love that bottom picture!